This summer, the Department of Education (DfE) announced that starting September 2016, schools across the UK would be collecting immigration data with the Early Years/School Census. This includes details of pupils’ nationality and country of birth. The Department of Education did not explain the reasons for this new gathering of information, nor did they explain who would have access to it. Groups such as Against Borders for Children are concerned that this new data will be used to facilitate immigration enforcement, using the information collected in schools to investigate and potentially deport individuals or families. Those fears are well-founded. 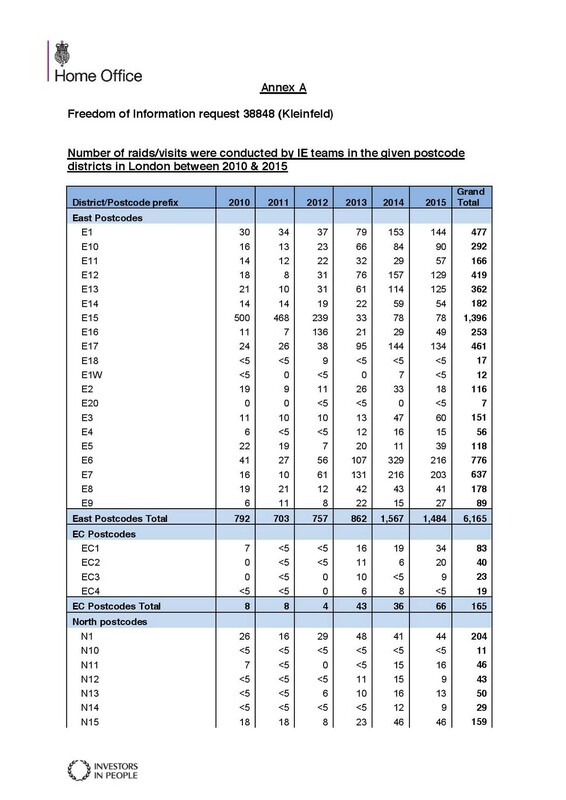 Data obtained through a Freedom of Information request (response delayed by the government until after census day), shows that the Home Office accessed information relating to pupils’ home addresses and schools 18 times in the past four years for the purposes of immigration enforcement; the number of individuals that this relates to is not clear. 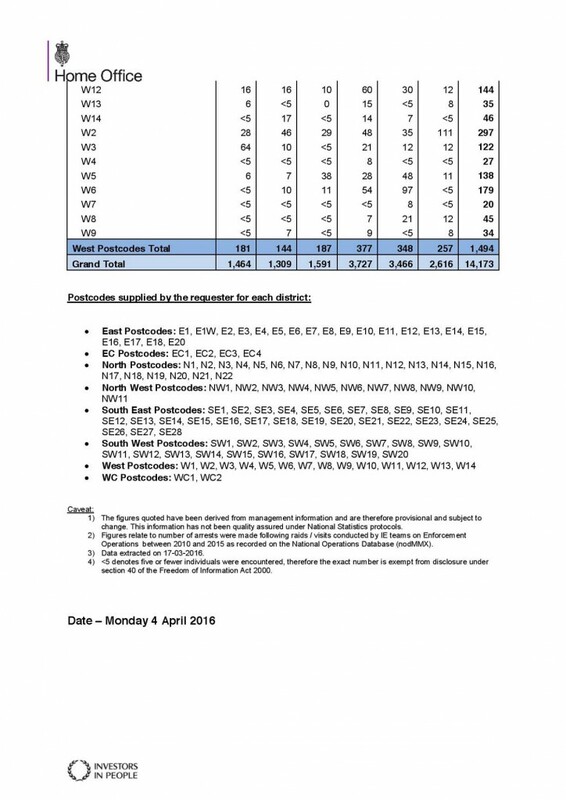 Access requests were reportedly made in response to Home Office efforts to track down parents who had disappeared after being told they faced deportation, or where the Home Office was trying to find unaccompanied children who had disappeared or gone to ground (read: children who were also faced with deportation). 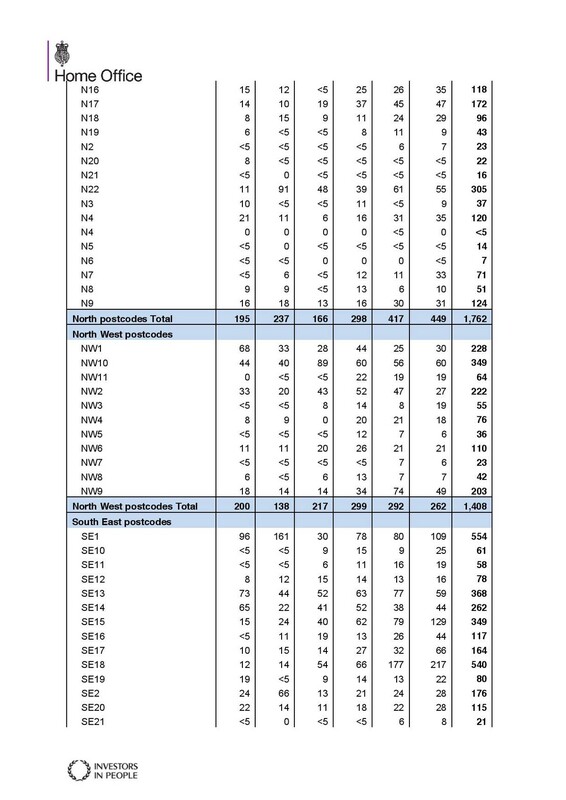 While the Early Years/School Census is a statutory obligation tied to government funding of schools, parents are supposedly allowed to opt-out of these new questions on nationality and place of birth. 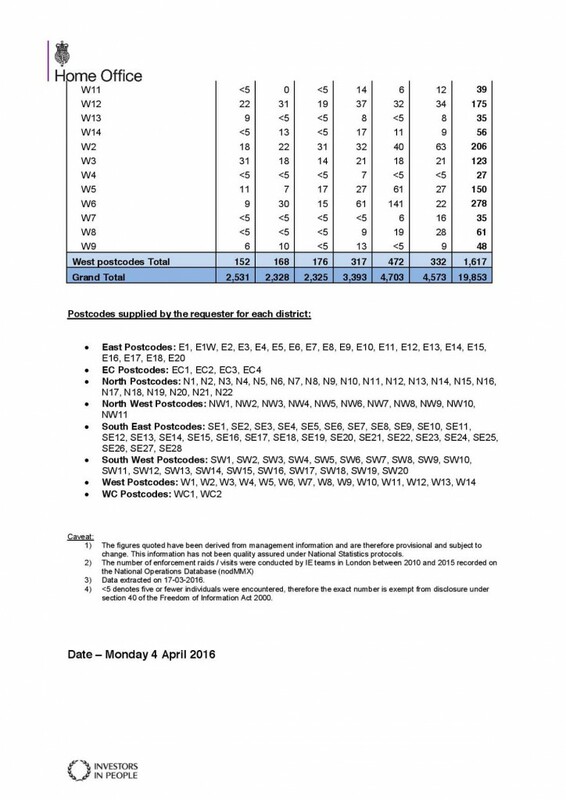 However, as the following interview with a Year 7 student goes to show, many schools are seeking this data directly from the students, and these questions are not easy to refuse, with social pressure and misinformation being used to urge parents to provide the information. It is therefore especially important that students and parents alike are conscious of what the census really implies, and are aware of their rights of refusal. Some parents and teachers have joined with Against Borders for Children (ABC) fighting against the collection of this immigration and nationality data. ABC provide sample opt-out letters to parents and appeal to MPs and schools to get behind the campaign. 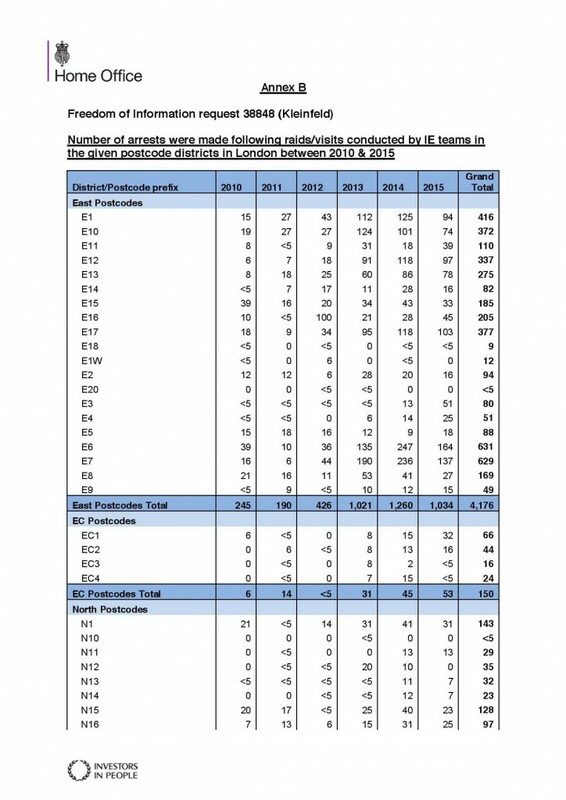 However, as Biplob points out, the issues run much wider than the mere collection of information; this situation underlines the tragic flaws and increasing surveillance within the UK school system. We hope that Biplob and students like him continue to find the courage to question this logic, and that they will receive the support and solidarity of their peers, their parents and teachers. The following is an interview with Biplob, a Year 7 Pupil at an East London Secondary school, and his experience of the census. On Friday morning, when I was going into class, we were told almost immediately that we were doing the new school census paper. We were told this was to collect our place of birth and nationality. Our teacher first had to explain what nationality was, as not many students knew what it is. This clearly shows how ridiculous this is, as not many students even know what this was about. As our teacher was going through it, I asked my teacher if I could refuse. After I asked this, she told everyone that they could refuse. I imagine that had if I had not asked, she would not have stated it. I then followed by saying that this was about collecting immigration data. The teacher disputed that it was about immigration data, saying it was just part of the school census. I told the class that this data could be pulled out by anybody and potentially linked to their name and address. My teacher continued to dispute this, and said that no data collected from the school would be given to any other person or organisation, other than the government. Our learning mentor for Year 7 came into the room looking for someone. My teacher asked her where she thought the data was going. The learning mentor said that its just going to the government, and that it was intended to just be added to our records. After she left the room, everybody continued to sign the census despite what I had said. I did refuse, but felt it was pointless because I was the only one. 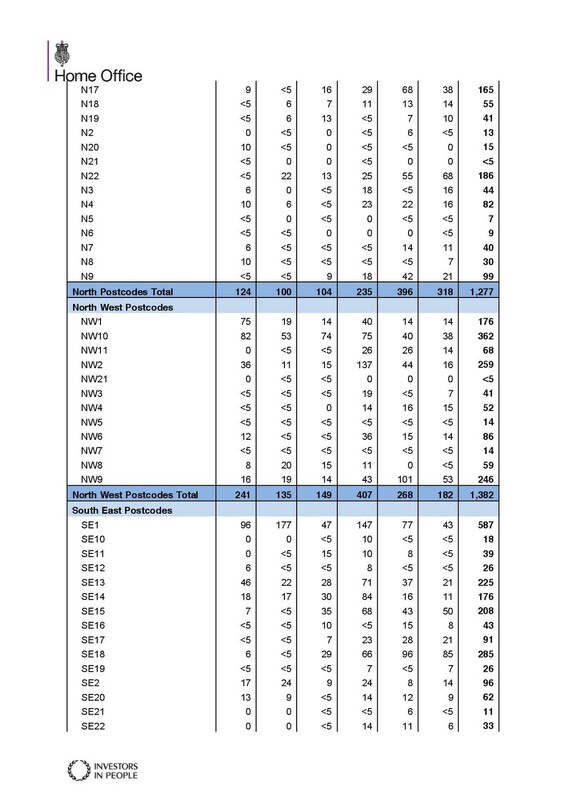 Do you think your teachers knew anything about the census, where the data was going, and what the purpose of it was? They didn’t know. 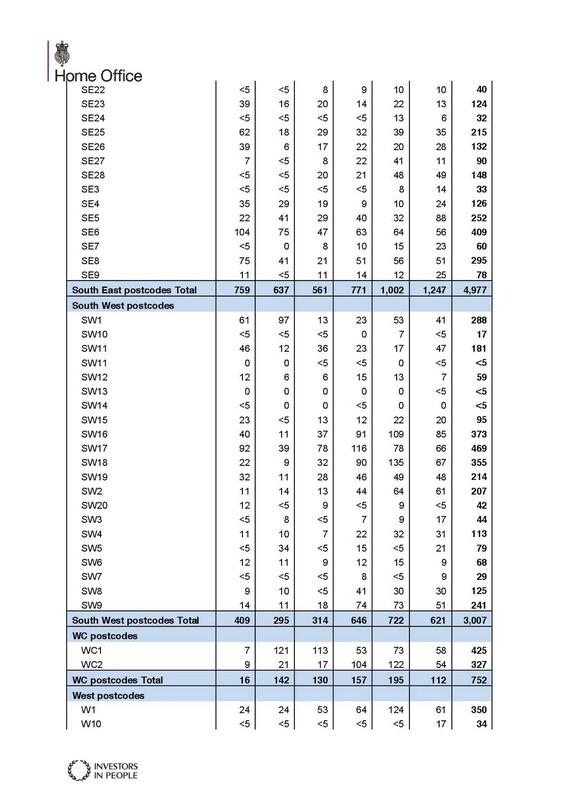 This is shown from the fact that they called it the census paper, and had to look up info from an email. I concluded that they had no information about what this was about. Do you think that, had the teachers known, they would have treated it differently? Had they known, some teachers would have still gone along with it, fearing their jobs on the line. Others would have appealed to deeper morals and refused. What do you think of the reaction of your classmates? Most of the class understood what I was saying, and believed me. They understood it as a debatable issue, around opinions, even though this is a fact. They took it as a debate. Why do you think no-one followed you in refusing to sign it? Due to the regimentation of the school, and the constant reminder that the schools ideas are always good for you there is the perception that if you refused, you would be punished for your ‘disloyalty’. Some people, especially those speaking worse English, thought it was best to just keep their mouth shut and do it, without fully understanding the issues. It seems like BECAUSE they did not fully understand, it was better to just go ahead and do it. Others, felt that it would not affect them, and just did it despite me telling them they did not have to. Whenever opposition is raised, in this schooling system, students are taught to obey and listen to the teachers. How do you feel about this implementation of collecting immigration data at school? It’s a strategy by the government to not only collect data, but also to brainwash children at a young age to obey the state. I had spoken about it with my mother about this happening before it happened at my school. It didn’t feel that bad, because it was not worse than many of the lessons I had to endure linked to Prevent. I was shocked they where doing it so early and that it was pushed around as something not very important. The teacher handed out some forms to pass around, asking us to fill them out and sign, making it seem as if it was just a normal class agreement, or informal document. When I refused, the teacher put the blame on me, singling me out and pointing at me directly, saying “you are choosing to do this…” as though I was doing something wrong. None of our parents were told. Why did you refuse? Why did you feel it was pointless? What do you think can be done to have more people ‘resist’ this census? I refused because I didn’t want to do this. It was a form of protest against the system. I also felt that I didn’t really know what it was about, and didn’t want to sign it because i didn’t know where it was going. I felt it was pointless that I refused because there are 300 year 7 students in my school, and 1500 in the whole school and I am pretty sure I was one of only a few who refused. Having a protest with 1/1500 is a very small protest, that has very little impact. Despite my opposition to this paper, it was a very small opposition compared to the total amount of students. More education about these issues is needed. We need some form of information in schools, such as leaflets, or discussions, debates, and so on. Groups like ABC, or Anti Raids could help out with it. However I think to get kids involved we need to bring in some incentive, such as missing school. This data collection could easily be a valid reason for a school strike. Not only would it be a clear political statement, but also, for us pupils, it would be a reason to miss school. A holiday almost! The next census collection date is planned for 19th January 2017. For more information on resisting it, check out Against Borders for Children. 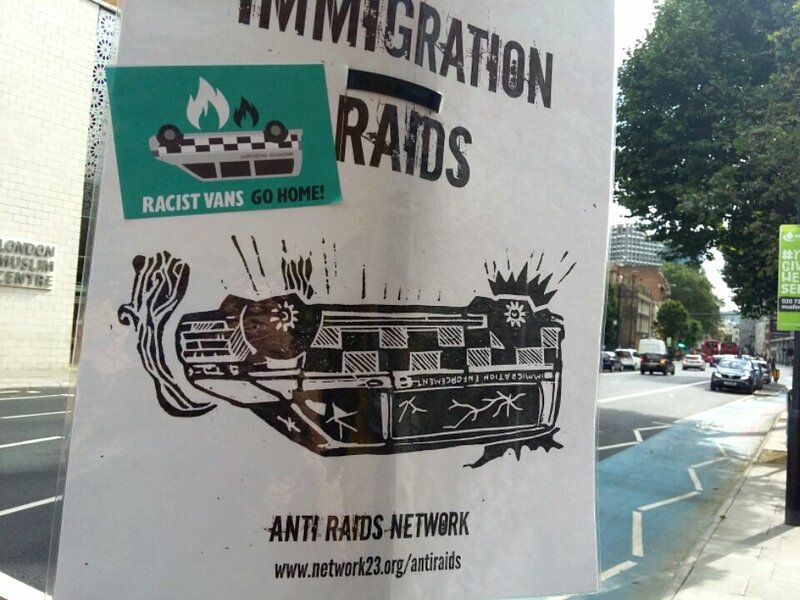 What is the Anti Raids Network? Groups and individuals involved in the Anti Raids Network recently met to reaffirm our principles and clarify these for people interested in getting involved. The following statement was agreed. Every day people are resisting immigration raids in their homes, workplaces and neighbourhoods. 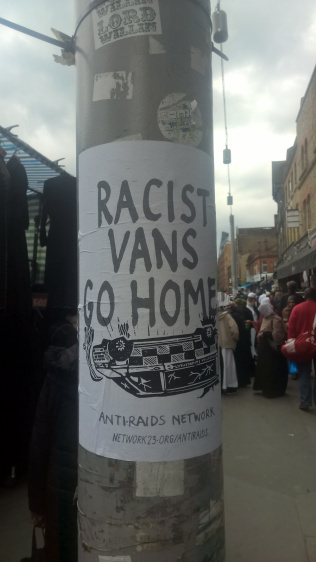 The aim of the Anti Raids Network (ARN) is solely to gather and spread information which could be used to oppose raids. Information includes alerts about raids, practical and legal resources, and stories and examples of resistance. ARN does not claim to organise or speak on behalf of those involved in this struggle against raids. Indeed, most of the people resisting raids will never have heard of ARN. ARN welcomes the creation of new initiatives against raids. People fight raids in many different ways. To give just a few examples: giving out legal information in different languages; running info-stalls to talk about raids in our neighbourhoods; gathering neighbours to challenge raid squads; helping people at risk to get away; physically stopping arrest vans; resisting inside detention centres, and supporting their struggles; organising in workplaces … and much more. ARN stands in solidarity with all those resisting raids, whatever ways they choose to fight. While individuals and groups may have their own different views about what tactics work best, ARN will not put out statements condemning any actions against raids. The network strongly supports resistance based on “doing it yourself”. That is, we all are most powerful when we join together in our streets, workplaces, and neighbourhoods, build up solidarity, and take action for ourselves. We do not work with political parties. Individuals or groups involved in ARN can act for themselves without seeking permission or consensus from the whole network. We ask only that those using the ARN name (1) support this and the earlier basic statement of principles, and (2) don’t claim to represent the whole network. Within that framework, any one is free to set up their own “Anti Raids” initiative: diversity of views, ideas, materials, etc. is encouraged! There are a few network-wide resources, for example: the central Anti Raids blog; email; and twitter accounts. The main purpose of these is to act as a general contact point and to spread basic information and alerts about raids. They can also act as platforms to publish ideas and opinions coming from individuals and groups within the network. They are not there to promote one “central” or “consensus” Anti Raids position, and may reflect a diversity of positions (again, so long as they hold to the shared basic principles). We are against hierarchy: that is, we don’t want to have leaders, rather we should all take responsibility to organise ourselves as equals. We are against both formal leadership roles and “informal” hierarchical structures. Anyone who dominates others should be challenged. The network is open to anyone who shares the basic principles. The participation of people whose immigration status puts them at most direct risk from immigration raids is encouraged and supported. But migrants should not have to stand alone in this struggle, we are all implicated in this fight. All who participate in the Network should do so as equals, treating each other with respect, directness and honesty. Please see here for more on how to get involved in the Anti Raids Network. The second in our series of personal accounts of people who’ve stood up to the officers. We think it’s important that people share their stories, to give courage and solidarity to others, and to show that you don’t need to be an ‘Activist’, a legal eagle, or a big tough guy to stand up to them. If you confront a raid and would like to share your story, please write a short account and we will publish it anonymously (unless otherwise stated). 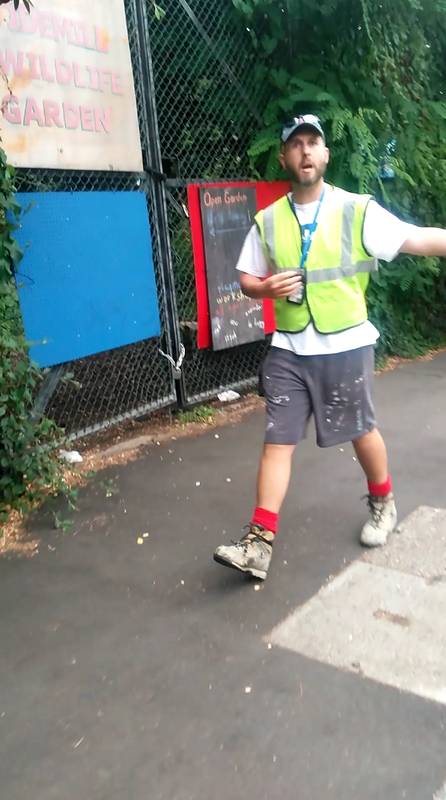 At about half 7 on Thursday evening, saw a guy coming out of the big tesco on Morning Lane wearing full navy blue – his shirt had unmarked epaulettes so I thought he might be from immigration. 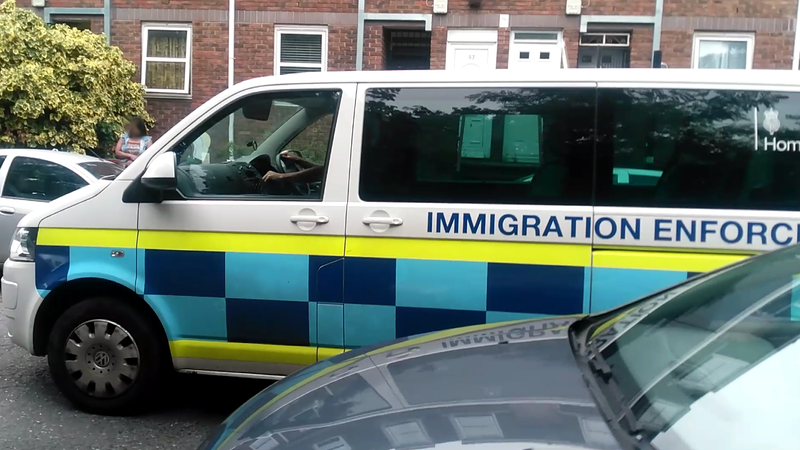 He walked towards 3 immigration enforcement vans that were parked together in the car park. A group of them were clustered around the vans, most of them also in unmarked epaulettes. As I walked past I caught the eye of one of them who I recognised from the other day – she waved over and said ‘hi Mary’ and so did the others. She and another guy came over for a chat. The guy was wearing full police style protection vest and badge. I mentioned this and he said “you know, work”. When I asked where they were going he said they were finished and going home for the day. I asked if they had a warrant for the raids today and he said yes, then launched into a massive rant. He talked for a while longer, saying that it’s written in the bible and the scripture of every religion that all people are equal. I asked if he meant all people with a British passport and he said “it’s not about the British passport. You’re just on one track but we have to think not just about ourselves and our lives but about everyone”. It didn’t make much sense to me to be honest but he continued in that vein for a while, at least a minute and a half. I said we were probably never going to agree and he said that’s the best thing about Britain, you’re allowed to disagree. Then we said goodbye and they left, I didn’t see where to. The Home Office has published new guidance on ‘arrest and restraint’, which, unfortunately, changes their policy on pursuit for the worse. We publish this update with two caveats. Firstly, it’s important to remember that the specifics of the law around raids is mostly informed by Home Office guidance, and much of it has not been challenged or clarified in the courts. As such, some of it may not be lawful. For example, in 2014 the Independent Chief Inspector of Borders and Immigration (ICIBI) reviewed Immigration Enforcement’s policy of using internal authorisation letters for raids (‘AD letters’), and found it to be unlawful in nearly two thirds of cases, a finding that has led to the apparent abandonment of this power in the past year. 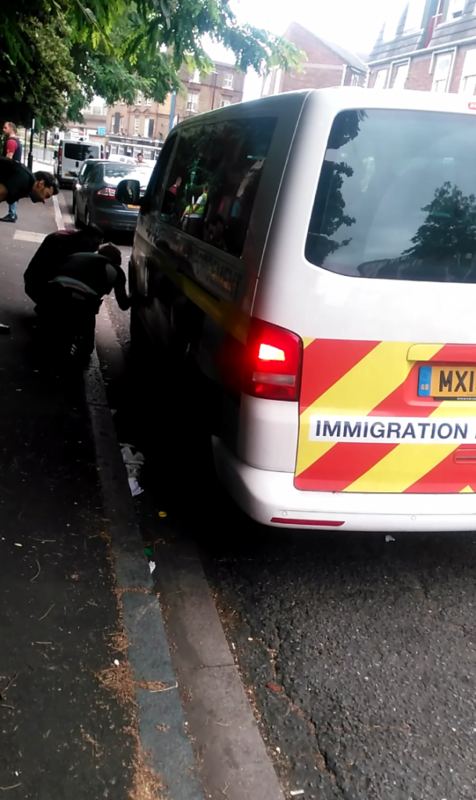 In response, Immigration Enforcement have shifted away from AD letters to the use of “informed consent” to gain entry, a power which shopkeepers and the ICIBI suggest is also being frequently abused. 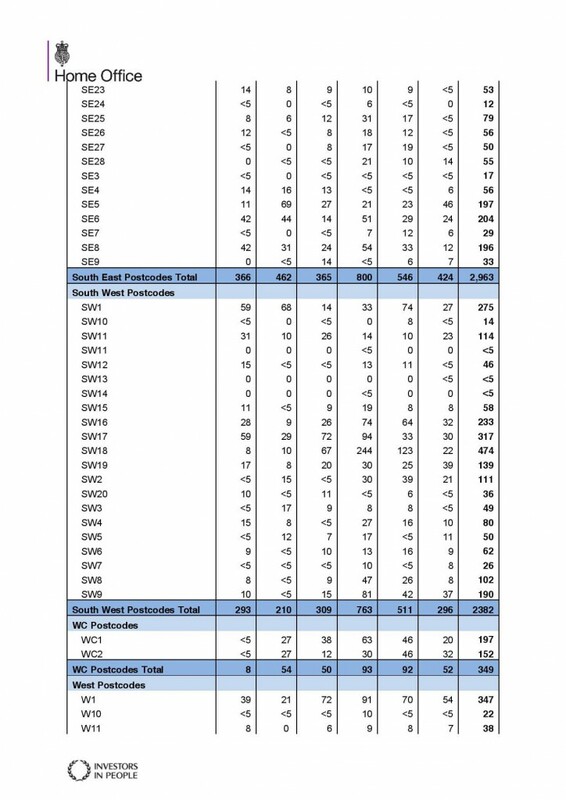 Secondly, it’s worth remembering that its very unlikely that a person without lawful immigration status has anything to gain by remaining on a site that is being raided: their odds are generally speaking likely to be higher if they can leave the site, especially without detection. Officers tend to block the exits and surround individuals to force them to engage with questioning, which means even the most polite and compliant person is going to have difficulty fighting their corner if they do not have legal status. Previously, IE guidance said that where an individual was seen to leave the premises, officers could not to pursue them unless they were aware of their immigration status. Therefore, if someone had managed to escape before confirming their identity as the suspect, or disclosing information that confirmed they too were an immigration offender, then – according to IE’s own guidance – that person should not be chased. However, IE changed this policy last month to allow leaving the premises itself to amount to reasonable suspicion that the person is an immigration offender, which could then potentially be used to justify arrest. The section is badly written and displays circular logic, as in the next section it clearly states that pursuit must not be given “where there are no reasonable grounds to suspect that the person is an immigration offender”. We assume that what they actually mean by that is that the person fleeing the premises is white. Once again, we reiterate that their new guidance has not been challenged in court nor subject to the review of the watchdog. The idea that a person’s arrest could potentially be justified on the basis of leaving a building during a raid brings to mind obvious questions around how customers will be treated during raids on businesses, given that people often try to leave before being trapped by the mobs of antagonists in bullet-proof vests. Will they be arrested too? 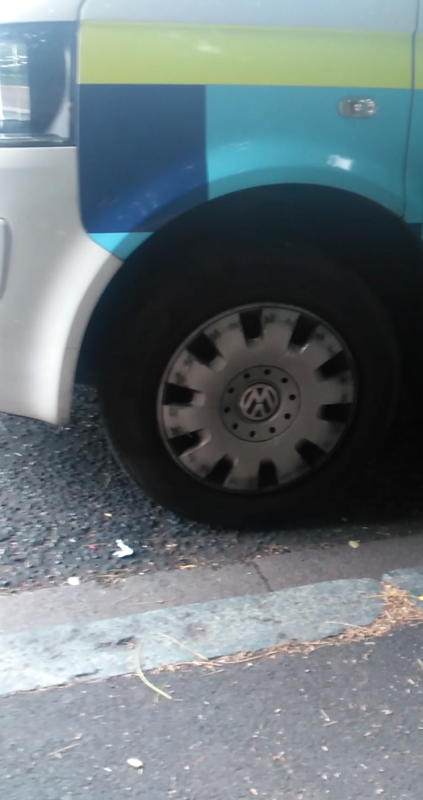 In practice we suspect that this is going to give officers more confidence to chase people. Our message however, remains the same: leave if you can without engaging in conversation, ideally in ways that will not draw attention to yourself. An attempt to leave the premises is not in itself grounds to suspect that a person is an immigration offender. A person who is not under arrest is free to leave the premises if they wish. However, the circumstances of the encounter may give rise to a reasonable suspicion that they are an immigration offender. It is not possible to detail all circumstances that might provide a reasonable suspicion that a person is an offender. Reasonable grounds can only be provided by a general assessment of the known facts, the situation as it is known at the time and a reasonable conclusion drawn from the many possible circumstances that exist. There may also be reasonable grounds to suspect that a person is an immigration offender based on their behaviour on being confronted by immigration officers who are clearly identifiable. On entering the premises the officer executing the warrant, or gaining informed consent, must identify themselves and other officers present, and explain their role and purpose to those present. If you see a person clearly attempting to evade contact with other officers you may reasonably suspect that the person was aware they were about to be questioned about their immigration status, and were trying to avoid questioning by leaving the premises immediately. You must take into account any other circumstances of the type listed above. This text was written by some people involved in the Anti Raids Network – it doesn’t represent the position of the whole network. A vast amount has already been said about ‘Brexit’ and the general climate of nationalism and xenophobia in which the vote took place. We want to concentrate on where we can go from here. Between rising fascism on the one hand, and despair on the other, we think it’s essential we build a culture of anti-fascism based on solidarity and autonomy. Solidarity here means taking action to support each other against those who seek to impose their authoritarian and racist ideal of a uniform society. Autonomy means unlearning our habit of looking to leaders for solutions, and taking the initiative to organise for ourselves. Rather than searching for the next political party/saviour figure/controlling coalition to dictate our direction and tactics, now really is the time for each of us who identify with anti-fascist position have the courage and commitment to take the initiative. Seek out and get involved in local groups, or better still, start your own*. Our groups and actions should multiply, not massify, and with this carry the crucial idea that anyone can be part of this struggle. We need to think creatively about how to effectively counter nationalist groups taking to the streets, but it is critical that we do not neglect the ‘respectable’ xenophobia of the suit-wearing demagogues in power and those who carry out their commands. Both these groups reinforce one another, with politicians normalising such practices as deadly border controls and the daily round-up of migrants from our neighbourhoods, while street groups and keyboard warriors garner citizen-support for these right wing agendas and demand that they be taken to more extreme levels. Too often, we respond to the latest oppressive state action or policy by seeking the validation of our friends and comfortable social media ‘scene’, rather than taking action. Instead of seeking solace from Twitter, why not go out and put up some posters? We also need to challenge ourselves to get out of our comfort zones, and not leave risky actions to some mythical ‘others’, who have no responsibilities or cause to fear repression. Of course, there are some who face more severe reprisals due to issues such as their immigration status, race or class – but anti-fascism wouldn’t be called a struggle if it didn’t carry any risk. When the time comes to hold the line, we need to be there for each other. At the same time, conflict cannot be sustained without a broader culture to nourish it. This struggle is not simply about the defeat of an authoritarian ideology; we also have to show an alternative form of power – the power of solidarity and real community. Our culture should carry the seeds of a new society, another way of life, and not be purely orientated towards what we oppose. …postering, organising cultural events, blocking immigration vans, leafletting, graffiti, running DIY martial arts clubs, neutralising nazis on the streets, sabotaging deportation attempts, giving workshops and skillshares, supporting resistance in detention, running regular stalls, making anti-fascist art and music, mobilising against evictions, taking direct action against the peddlers of nationalism and bigotry…… building an anti-fascist culture takes these forms and many more. We should recognise the value of all these actions and encourage & support different people’s contributions according to their interest and skills. These are just a few possible guidelines for what we hope will be a fiery, emancipatory, and truly grassroots resistance that can be our only response to the shackles of nationalism, borders, and state control. See here for more ideas for what you can do to fight the raids. The border regime manifests itself in our everyday lives. 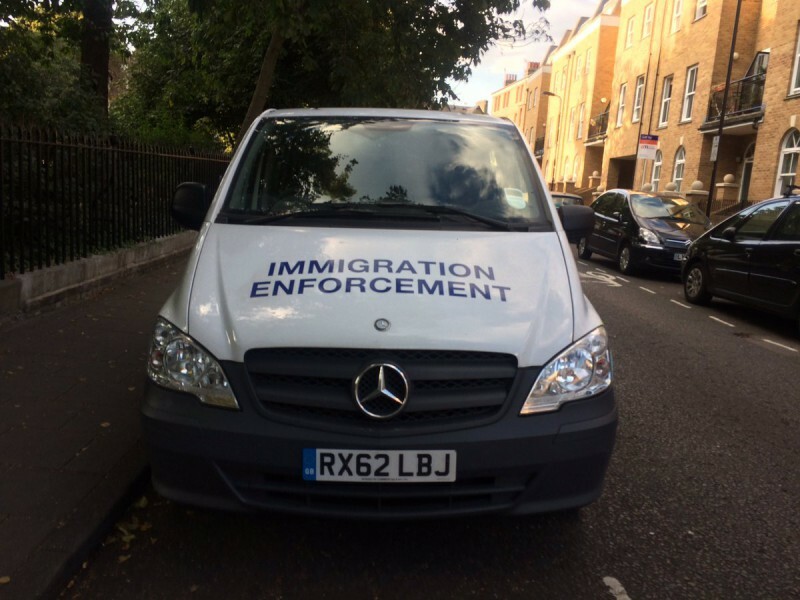 Home Office “Immigration Enforcement” teams – working hand-in-hand with the police and local authorities – attack us on our streets, in our homes and workplaces. Whitechapel – and Tower Hamlets more generally – is one of London’s most racially diverse areas, with large Bangladeshi and Somali communities. This working-class neighbourhood has not escaped the growing wave of racist state repression and fascist activity. 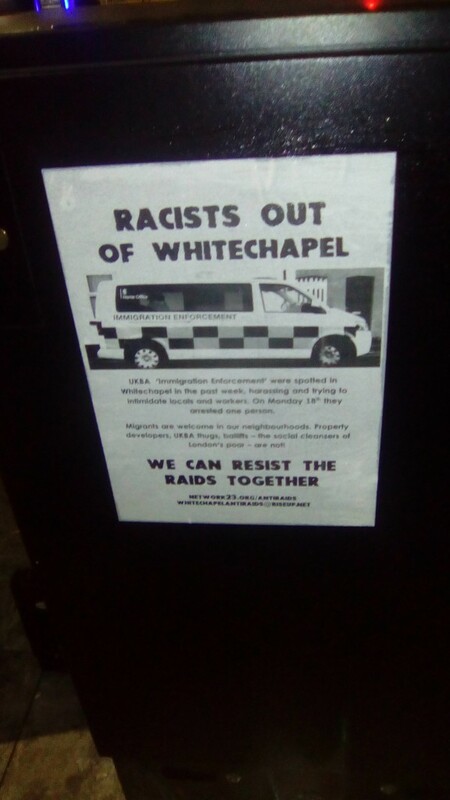 Over the past few years, Whitechapel High Street has counted among the growing list of places systematically targeted by UKBA and police operations – as well as recent “flash-mobs” by far-right bully-boys Britain First. 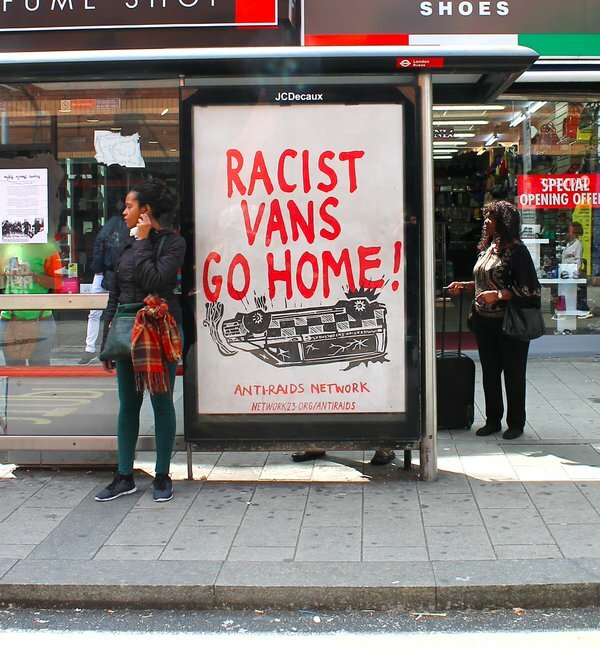 At the same time, Whitechapel is on the front-lines of social cleansing in London. Property developers and landlords are fast making the area into another yuppified wasteland. Immigration raids have served in parallel to gentrifying forces, damaging and undermining the local economic base of Black and Asian working-class communities. Against this backdrop, we have come together to form Whitechapel Anti-Raids. Over the past few weeks we have been busy leafleting the shops and market stalls in Whitechapel. 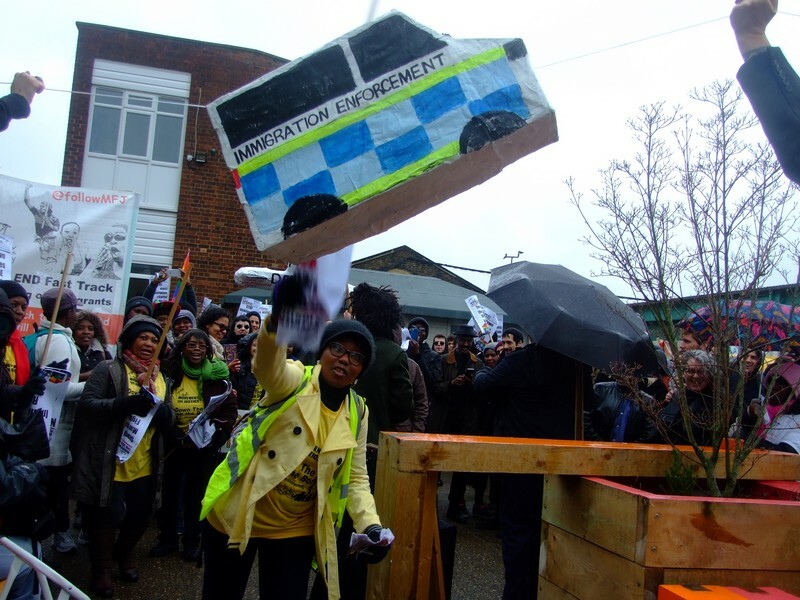 The first of weekly Saturday stalls was set-up last weekend at Whitechapel market – with multilingual bust cards and information about immigration raids, worker’s and housing rights. The response has been overwhelmingly positive; many individuals, workers and small business owners have welcomed the initiative. In conversation, many expressed their frustration and anger at the racist targeting of their shops and community. We aim to promote a culture of neighbourhood self-organisation, solidarity and collective self-defence against all forms of state repression and racism. We don’t want to reform immigration enforcement, but to resist and eventually end it. For every raid and fascist “flash-mob”, we need a response. To get involved contact us at whitechapelantiraids@riseup.net or pop down to our weekly Saturday stall (2-4pm) in Whitechapel Market.